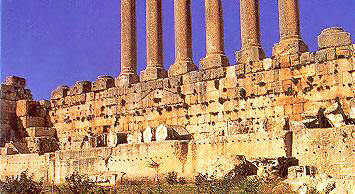 Baalbek is the name of an archeological site in Lebanon. In Roman times it was known as Heliopolis or City of the Sun. An example of how ancient is the site can be found in that its holiest area (in pagan times) was the Temple of Baal-Jupiter — a hybrid between the ancient Canaanite god Baal (lord) and the Roman Jupiter. 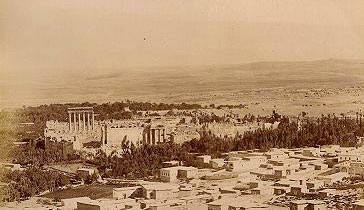 A panorama of ancient Baalbek, seen from a nearby hill. The ruins are the Roman temples of Bacchus (foreground) and Baal-Jupiter. 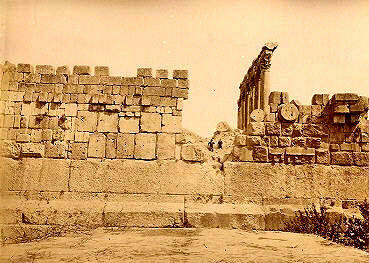 Back of the temple of Baal-Jupiter. Smaller stones of Roman date are haphazardly placed on top to form a medieval fortress. At the bottom of the picture, between the 2 trees, a man contemplates their size. Can you see how small he is compared? One stone left in the quarry, undressed yet. They are great, perfect rectangles. 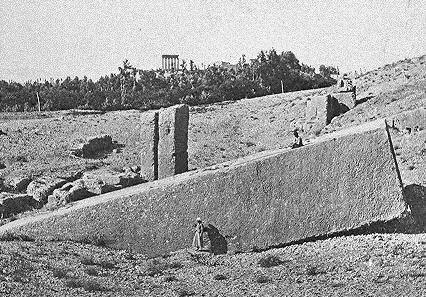 This is a picture of the largest worked stone on earth. Some have estimated it to be 2,000 tons. 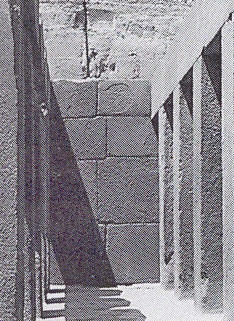 Another example that they are separate to the Roman temple, is that while the Romans built the back of their temple wall flush with 3 of these stones, on one of the sides of the temple of Jupiter the perimeter clearly falls short of the width of the original megalithic structure, allowing a tier of megaliths to protrude obtrusively from the temple foundation— incongruous if they were simply foundation stones for the Roman temple. But it seems the Romans could not extend the building far enough to cover the layout of megaliths. The great stones continue on this side as well, though their substructures are still buried. another indication they are not designed for the temple but predate it considerably. Extraordinary picture. This shows the famous backside of the temple. 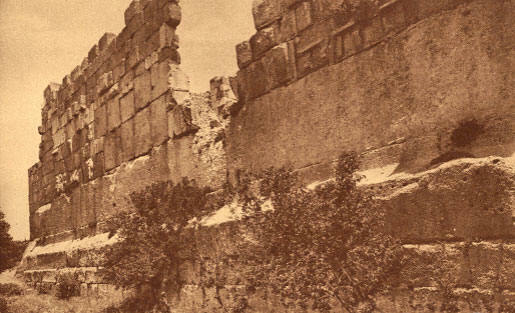 The stones of the ruined Roman temple were piled up to form a wall. There is even a column base. But see the huge stones next to the break in the wall. They are as big as the Bimini stones and cut flush with the other, rather than neat squares. This architecture, “Cyclopean,” is the oldest we know of, yet it appears sloppy and small compared to the great megaliths below them. 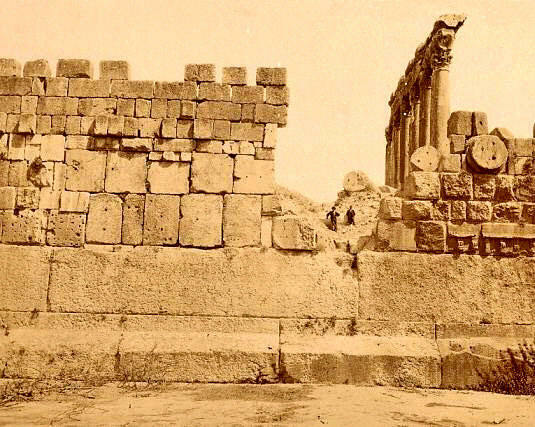 Left, the excavated walls of Kafre’s (Chefren) temple. It stands in the shadow of no less than the 2nd great pyramid at Giza, Egypt. 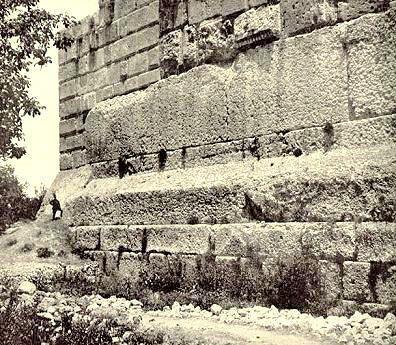 Even this very ancient monumental wall seems later than the megaliths at Baalbek. They match some of the unascribed stones built thereon, however, possibly by later peoples or early Canaanites.